Dominating a number of key markets across the world, Including the USA, the UK, Canada and Australia, iOS is considered a go-to mobile platform for business applications. Indeed, iOS has proven to outperform its main competitor, Android, in terms of app revenue and adoption. Yet, emerging technologies bring iOS app development to a new level in terms of swiftness and usability. Ignoring them would be a lapse in judgment for every modern company. Choosing the appropriate technology stack is one of the most important decisions you will need to make when building an iOS application. That is why the Objective-C vs Swift dilemma has been a subject of a heated discussion for the last couple of years. Swift is a universal and powerful programming language created by Apple as a modern alternative to Objective-C. Since its official release back in 2014, Swift has come a long way from being controversial and often criticized to becoming the most popular programming language and the most sought after tech skill. Used primarily to build applications for iOS, Mac, Apple TV, and Apple Watch, the language has been quickly adopted by developers in the iOS community. With Apple’s recent “big move,” open sourcing its brand new programming language, Swift is posed to grow even faster, fueled by the combined effort within the iOS developers’ community. Many of the most talented developers are early adopting Swift and are transferring their current projects to it, which is remarkable for such a young technology. 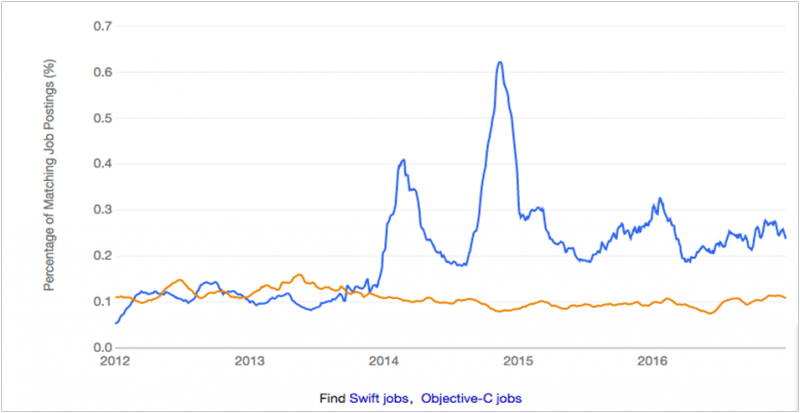 Yet, it seems its predecessor won’t be losing its footing any time soon: trends represented by Indeed.com show a steady demand for Objective-C developers. Thus, both languages will continue to co-exist in the iOS ecosystem, at least for now. Running an application build with Objective-C (or its combination with Swift), is totally fine as long as the latest version of the language is used. Aside from that, how safe is it to build a new app completely on Swift? What are the benefits of such an approach? Through the use of actual cases and concrete examples, the following information contains our perspective on the benefits that Swift has to offer. Swift benefits: Why choose Swift for your new project? From the very beginning, Apple positioned Swift as a fast and lightweight language (well, its name speaks for itself). According to the official information published by Apple, Swift is more than 2.6 times faster than Objective-C, and the number grows with each new language release. For a customer-facing application, even a small difference in speed can be a crucial element which can define the success of the product. If your product needs to handle heavy computations or has complex business logic, speed and performance become even more important. That is what makes Swift the technology of choice for building fast and efficient consumer-facing apps. Swift code is really close to natural English. It is clear and concise, which produces a positive impact on developer productivity. Being a part of the Apple developer tools ecosystem, Swift provides all the necessary tooling out of the box. Besides good old XCode, Swift provides developers with an excellent opportunity to see code in action instantly, through the use Swift Playgrounds. All these aspects make Swift development fast and efficient. This, in turn means more time and money saved for you. Furthermore, according to Stack Overflow Developer survey, Swift remains one of the top most loved programming languages for the second year in a row. The fact that developers have complete admiration for the language contributes greatly to the developer’s motivation and productivity. With Swift, your developers can use advanced error handling to avoid most of the typical mistakes that occur in Objective-C. While in Objective-C some flaws may go unnoticed and can later lead to unpredicted system behavior. There is reduction in the feedback loop because the mistakes in the Swift code become visible through compiler errors and can be fixed instantly. The outcome being fewer crashes and bugs in production, which significantly reduces the amount of time and money spent during the testing phases of development. Indeed, Swift provides the tools and the resources to build apps for every device in the Apple ecosystem, from Apple Watch to Apple TV, out of the box, which means 100% compatibility and allows you to open the full potential of the hardware without any limitations. In addition, the language is currently evolving as a server-side programming tool, which opens even more possibilities for further advances. As an open source project, Swift is growing really fast. It is currently the most starred project on GitHub, with over 450 active contributors.Besides that, open source status means there are many free tools, libraries and frameworks that can speed up development and save time and money. Similarly, open source Swift is predicted to expand well beyond the Apple ecosystem. Aside from being applied in backend development, as mentioned above, Swift might soon be used to build Android apps. Apple is not the only big name behind Swift. IBM has recently been very active in a number of research areas related to Swift. Namely, the company is working hard to bring the language to the cloud, advancing it for server-side usage. Thus, you will be in good company when choosing Swift for your project. There is already a great variety of tools in the IBM ecosystem, integrated with Swift: The IBM Swift Package Catalog now has more than 1,500 client- and server-side packages, having grown by 400% within 6 months. Less code means less legacy and reduced cost of maintenance. Being a compact language, Swift requires less code to perform the same tasks as Objective-C. As an example, Lyft has recently re-engineered its mobile app using Swift. The company was able to reduce the code base by over 70%, from 75,000 to 22,000 lines of code, while keeping the same functionality and performance. When to hire Swift developers: use cases. Despite being a relatively young language, Swift already has an impressive portfolio. Such companies as Lyft, LinkedIn, Airbnb, Eventbrite, VSCO and Hipmunk are using it in production. For those who are still not sure about choosing Swift for their next project, here is a collection of use cases, when proves to be more beneficial. MVP development – Swift is perfect for fast and lean development of a minimum viable product. Consumer-facing apps – Swift is a good choice in those cases when performance and speed are considered to be critical. Enterprise apps – supported by IBM, the Swift enterprise ecosystem continues to grow, which offers a lot of opportunities for building business oriented apps. Apps with cross-device support – if you are planning to further expand your app reach by porting it to Apple Watch or Apple TV, Swift could be a great choice, as it provides 100% native hardware support out of the box. As for the existing products, the decision to port them to Swift might be harder to justify. If you are still considering the options, we would be glad to help you make the right choice. Fill in this form to get a free consultation on Swift development.